Is California Lowball hard to master? What are the basic rules you need to cover before starting your first round of this highly addictive game? Keep reading to find out! Lowball poker, otherwise known as low poker, is a pretty interesting poker version. Basically, you need to achieve the lowest hand in value in order to win. Pretty sweet, huh? The California Lowball was a fan favorite game in this US state during the 70s, even before the casino players around the world went nuts for Texas Hold’Em. This game is very interesting to play, and we will show you how in the following passages. The California Lowball is also known as “Ace to Five” Lowball and is largely based on the Five-Card-Draw Poker, since you draw five cards in this game too, as the name would suggest. Your goal is to get a perfectly low hand, and that hand is 5-4-3-2-A. Bear in mind that the lowest hand wins the pot, and straights and flushes don’t count when playing it! And what about those Aces? Well, they play a crucial part in deciding which version of lowball will be played in the first place, which depends on how the Aces will be counted as — lows or highs. Additionally, it would be ideal if you had five cards in your hand with different values, since they top the duplicates. It couldn’t hurt to mention one other very entertaining lowball poker version — the Kansas City Lowball. Namely, this type of low poker, otherwise known as “Deuce to Seven” Lowball, is the second most popular game of this kind, in which the highest hand also loses. So next time you are sitting at a lowball table, pray for the lowest card to be dealt your way since a high card in the poker hand will be your doom! No Lowball game can work without a dealer — they draw the cards for you and makes sure everything else goes smoothly while you enjoy the game. Every player will be dealt five cards, and after that, the round will commence with the first player on the left of the dealer. In addition, there are some differences regarding if you are playing with the blinds or rather with an ante. Namely, if you choose to play with the blinds, the dealer will post the small blind. After that, the first player on their left will have to post the big blind, and that will be the minimum bet amount for the game. On the other hand, if you are playing with an ante (which is not so common), the second round will start with the same player that opened the first one. In this case, not with the player left of the dealer, like it would be in case of you using blinds. After the cards are dealt and the first player has made their move, the remaining players are proceeding to make their own. For example, they can discard the highest cards they have, since the goal is to have the smallest hand. The drawing of the cards goes clockwise, after the player to the left of the dealer has started first, as we’ve mentioned before. 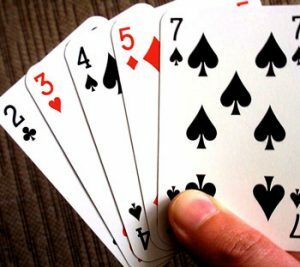 Furthermore, the number of cards that can be drawn by a single player is four, and if they want to draw more after that, they can get the fifth one only after all the other players have taken their turn at receiving the cards. As for the last player drawing the cards, in case they want the fifth one too, they will have to burn the last one after the player before them, and then get a card after that one. Moreover, in case you are playing the California Lowball limit game, you will notice it goes a bit differently. Namely, after the drawing is finished, the bets need to be doubled. Also, there are some distinctions when playing a Single Draw, a Double Draw, and a Triple Draw, which we will further explain. In this version of the game, the Joker card is added to the play. This card is quite important in many casino and card games since its value is unknown, so it can have different roles from one game to another. In this case, the Joker card is also known as a bug — and it is the best one you can get. The most important rule to remember in a Single Draw Lowball is the rule of “Must Bet Sevens,” which is applied here. Namely, this means that whenever a seven low comes up, you need to bet — if you are the one that drew it, of course. Additionally, in the Single Draw, you are not allowed to apply the check-raise strategy. It is used to get ahead by waiting for the other player to open first, before making a move of their own. The Double Draw gives the players two chances to improve their hands — meaning, they can draw the cards two times. Additionally, there are three betting rounds — one after the cards have been dealt, then another after the first draw, and the last one after the second draw. The Triple Draw version of California Lowball gives you three draws and three chances to achieve a better hand. In this version, the Joker card is not used, since there is a bigger possibility for it to come up and for the game to be over sooner. Also, the dealer will run out of cards much sooner, so they need to shuffle more often in order for the game to go as smoothly as possible. California Lowball is a pretty interesting version of poker that quickly became a fan favorite among the American players. It is unlike many other casino games since it stands out by having the goal of achieving the smallest hand in value, instead of the highest. This game has a few simple rules that are quite easy to learn once you covered the basics. No matter if you choose a double or a triple draw version, you are sure to have a lot of fun while playing it.